The instrument is a powerful modern Markneukirchen master violin made by Werner Voigt (*1911) who later worked in Stuttgart. This attractive Guarnerius modeled master violin was made in 1964 as a fine masterpiece of expert craftmanship, it bears the original label. It follows the Markneukirchen tradition on the model of Guarnerius. This fine piece features tonewoods of the finest quality and selection, the quality of workmanship is exceptional. The varnish is an oil varnish of an intense orange color, applied on a lighter ground. 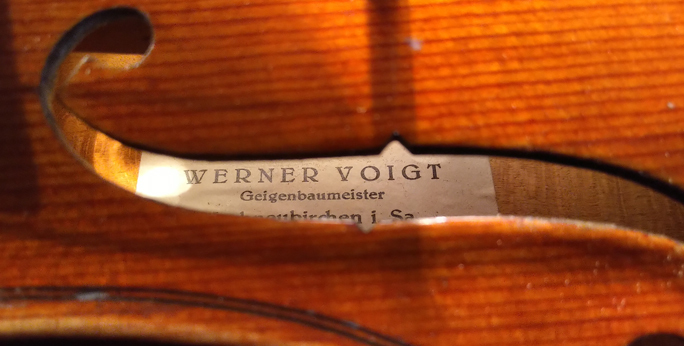 This rare Werner voigt master violin is undamaged and in perfect conditon. Its bright mature Guarneri sound is very strong, clear, dominant and rich in overtones - up to the high positions. Please have in mind that new Markneukirchen master violins of similar quality are not available below € 8,000 - 10,000.